I'm with you. If we could have days in the seventies right up into late November, it would be simply awesome. Actually, I could stand it year round. But then that IS asking too much! hahaha. So glad your living room is cool enough to enjoy watching the Championships on television. Pogo and I watch TV a lot on these wicked hot days. We are having a few more wicked muggy days too. Thank goodness for the A/C. It helps to keep it cool indoors. I hope it cools down soon for you. We might get some cooler temps later in the week. I hope so. Those meals you are making sound so delicious. I had a salad last night for supper. They are easy to make. 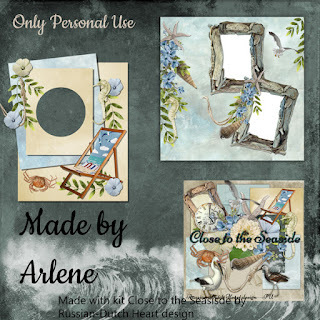 As usual, Arlene's work is lovely. Thank you. Now I'm off to get a nice cold bottle of water. You have a wonderful week my friend, hugs, Edna B. So happy to hear your life is now uncomplicated and you can enjoy the rest of the summer without worries. Besides the heat, that is!! We have up and down temps too and unfortunately out in the country there was a tornado the other night. Very destructive. We never used to get them but now with global warming and such they have become a real nuisance. You inspired me with the potato salad as the end of the week is going to be extreme heat again. Take care both of you. Hello Kyra and Arlene and Thank you for these lovely clusters. Hello Kyra & Arlene, Thank you for the kit and the extras from Arlene. Just lovely. I could use some nice seashore breezes about now. Yesterday was 109 but I didn't leave the house. This morning I did but buddy at the bank says only 89 today. That's nice. I'm all into Autumn and Spring. Starting to cool down the hibernate like the bears and come out when it starts to warm up. And I eat Salads O'Plenty in this type of weather. Good for us any way. I'm in Michigan and I think I've spent most of the summer staying inside. This hot and humid weather is very draining. I must thank you again for your creativity and generosity! Thank you to Arlene, am still catching up.